We learned at lunchtime today (December 5, 2018, EIE) of the tragic news that Alan MacSimoin has died. It was sudden and hit us hard. Alan was a social historian, political activist, trade unionist and great supporter of the Come Here To Me! project from day one. Originally published by Come Here To Me. Alan first became interested in politics in the late 1960s as a young teenager in Dublin. Paddy Healy recalled a very youthful Alan approaching him outside the GPO to buy a copy of the Young Socialist newspaper. While a secondary school student at Newpark Comprehensive School in South Dublin, Alan joined the youth wing of Official Sinn Féin. He recalls that the Special Branch visited his home and school in attempt to intimidate him as was a common tactic back then. Alan was centrally involved in the Irish Union of School Studentsin the 1970s which at its height had 7,000 paid up members. Alan then became interested in libertarian socialist/anarchist politics and remained committed to these ideals until the day he died. In the 1970s, he was also active with the anti-Nuclear movement and the Murrays Defence Committee. Here is a wonderful photograph of Eddie Conlon (left) and Alan (right) at Dunnes Stores strike picket in 1984. Alan at Mayday march in Belfast, 2006. In the last couple of years, Alan was heavily active with the Stoneybatter Against the Water Tax and the Dublin Central branch of the victorious Together For Yescampaign that repealed the 8th amendment. Our deepest condolences to his partner Mary Muldowney and his extended family. 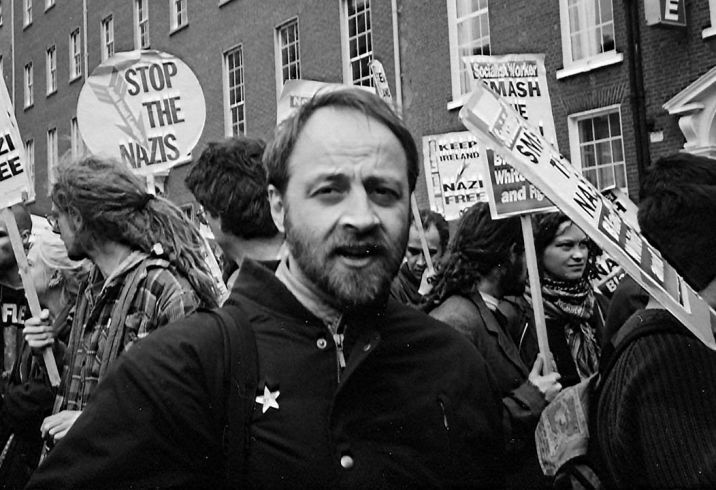 2013 recording of Alan speaking at a public meeting about his involvement in radical politics in 1970s/1980s Dublin. Starts about 5mins 30secs in. Link. 2014 recording of Alan speaking about Irish Squatting history. Starts about 12mins in. Link. 2015 interview of Alan speaking about his early entry into politics. Link. 2017 recording of Alan speaking at Peter Graham memorial meeting. Link. 2018 post from Look Left Magazine (Workers Party) marking his passing. Link.